He’s always been a Milanista. It was always his dream to play for Milan. So when Milan came calling, it was perfect… almost. If only his father had lived long enough to see him wear the jersey. But Acerbi thinks about him all the time, and is sure he is smiling from above, thrilled that his son has finally achieved his dream. Francesco Acerbi, meet your destiny. Francesco Acerbi grew up in the Lombardy region, and was always a Milanista, much to the disappointment, I’m sure, of his father, who was an Interista. 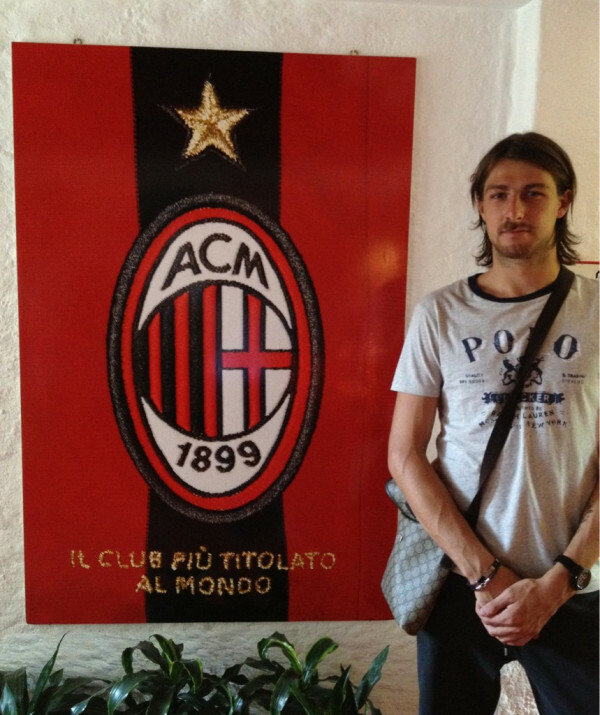 Acerbi played his youth career and the first years of his senior career with then Serie C2 team Pavia. He made one appearance for Serie D side Renate while on loan in 2007, and then spent the entire 2007-08 season on loan to then Serie B side Spezia, where he made zero appearances. He then stayed with Pavia through the 2009-10 season. From 2006-2010, he made a total of 48 appearances for Pavia. For the 2010-11 season, he was transferred to Serie B side Reggina, where he was finally a starter, making 40 appearances for the club and even scoring 2 goals. This sent him up to Serie A the following year, transferring to Chievo in a deal that ironically sent Kevin Constant to Genoa at the same time. However, he wasn’t a starter at Chievo, and in January, his agent was looking for a say back to Serie A so he could get playing time. It had been a rough 6 months, considering that his father passed away in November, and Acerbi just wanted to play. He didn’t have to go to another team, though, as he finally began to get playing time for Chievo in January, racking up a total of 17 appearances and one goal for the Flying Donkeys, all in this calendar year. And so, with his father’s passing still raw in his heart, his dream team, AC Milan came calling and offered him a contract this summer. Ironically, Kevin Constant once again moved in the same deal, this time from Genoa to Milan. Hopefully they will both bring each other luck. And despite having forced his dad to take him to the San Siro when he was a boy to see Milan, Acerbi believes that his father would be pleased that he has finally reached his destiny. The tall (1.92m or 6’ 3 ½”) center back has been welcomed at Milan, despite having very little Serie A experience, particularly since we lost our two best center backs this summer. While reviews are mixed so far with his performances during the summer friendlies, Acerbi, who just turned 24 last Friday, seems like a promising relatively younger talent that just might fill a desperate need we have in defense. And if his confidence continues to grow as it has already in just a few games, he will likely find a lot of relieved Milan fans cheering his name. He seems like one of the nicest, most genuine guys around, saying he doesn’t have a girlfriend right now and doesn’t like to stay out late or party because he’s focusing on football (ladies, take note!) 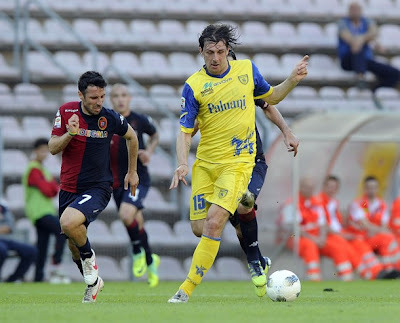 But his character shone through this past season in a Chievo-Palermo match. The score was 4-4, it was the final moments, and he convinced the referee to change a decision, awarding a corner kick to Palermo when he had originally given a goal kick to Chievo. 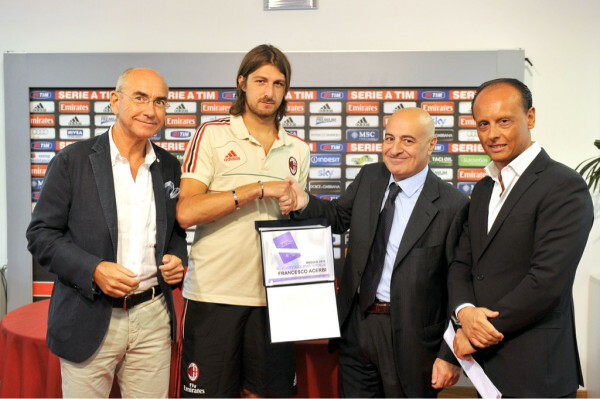 This display of fair play, despite the potential cost to his team, won him the Cartellino Viola, or Purple Card award, for fair play in Serie A, which he was awarded in July. The big question is will his choice of numbers help him or doom him? He had wanted the number 15, which was already taken, and so instead chose Nesta’s number 13, confessing that Nesta was an inspirational player to him. But will the number weigh heavy on him, or will he receive a little extra help from the greatness associated with it? Only time will tell. 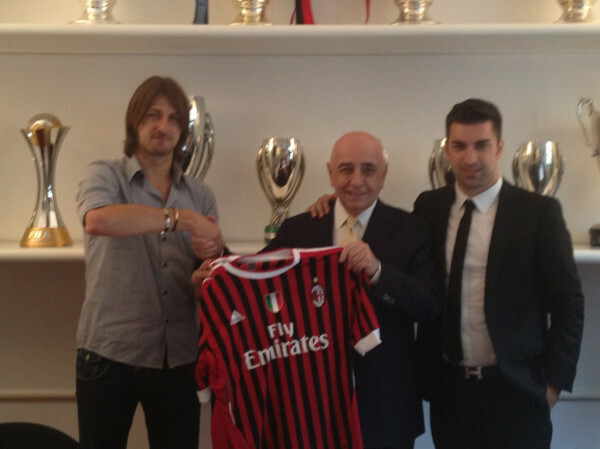 Certainly, Acerbi has reached his lifelong dream of playing for Milan. He thinks of his father all of the time and wants to make him proud. He is perhaps one of the happiest signings of the summer, happy to be wearing the Rossoneri colors. And yet he is levelheaded and hardworking, too. Today he could see his first cap for the Italian national team, another dream come true for him. And despite the pressure, he is anxious to be our dream come true, too. Benvenuto, Acerbi. We are all hoping that you truly have met your destiny.